Genua urbs maritima, i.e. “Genoa, a maritime city” is the title of a woodcut from the 15th century which portraits the city with the port in the foreground. Genoa grew up, developed and conquered an important position in Europe’s history and economy. 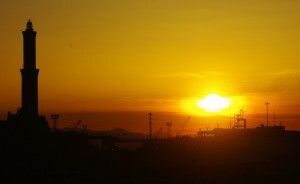 As a maritime city, it has strongly been connected with its port since the beginning of its history. Guarded by two strips of land – the eastern Molo Vecchio and the western Promontorio – and surrounded by northern mountains which protect it from the wind and enemy assaults, its favourable position makes it a commercial junction of pivotal importance. It is the door between the Mediterranean Sea and the north, the natural way to the Po river valley, and a location on the route to Marseille, another crucial Mediterranean port. The port’s original appearance coincided with the natural bay – today’s heart of the Ancient Port – and the oldest descriptions about construction works date back to the Early Middle Ages, in the age of the Comune, at the same time as the institution of the Sea Consuls, in charge of controlling that port activities – among which maintenance and expansion works – were performed correctly. In the 12th century Genoa’s trade in the Mediterranean Sea expanded and the city became a commercial hub for luxury goods coming from the East and from Flanders. This development generated banking and financial activities which turned Genoese bankers into key players in Europe’s economy. From the mid 12th century, the port was widened with the construction of Molo Vecchio (“the Old Dock”), on the natural platform provided by the rocks. On top of it Torre dei Greci (”Greeks’ Tower”) was built in order to signal the port entrance. The defeat of Pisa, Genoa’s age-old enemy, meant that the war loot could be used in order to build the harbour, the navy yard, the boathouse and two basins: one was used for the galley fleet whilst the other was designed for wine trade. Meanwhile, the Palazzo del Mare was built in front of Sottoripa in 1260. The building named Palazzo San Giorgio, which currently hosts the Port Authority, was the headquarters of Banco di San Giorgio, the forerunner of modern banks. The construction of the Lighthouse dates back to the early 14th century, even though we know from sources that a spotting tower had existed since 1128 and since 1161 the ships arriving in Genoa had had to pay a tax for the service provided by the Lighthouse. The area inside the old dock was used for berthing smaller boats. They were so numerous and packed that they looked like a herd (mandria in Italian). Hence, the place was named Mandraccio. The port structure remained substantially unchanged until the late 16th century. The largest interventions involved the dock (supplied with a smaller lighthouse), which in different periods was expanded until ,1553, when the Porta del Molo (or Porta Siberia) designed by Galeazzo Alessi was added to mark its length, measuring 490 m. The six bridges, perpendicular to the shore, took their name from the product that was unloaded or from the families living close by. Originally, wood was the only construction material, but starting from the 15th century they were built in stone while the dock was strengthened and the harbour was excavated so as to to allow larger and larger ships to berth at Genoa. Highlighting how important the port had become for the city, in 1363 the Padri del Comune (“Comune’s Fathers,” translator’s note) were also named Salvatores Portus et Moduli, meaning “Port and Dock Saviours”. They had direct responsibilities in the port’s administration. They were also given special powers, while their appointment was based on specific technical competence. A different, though as important, historic role was that of camalli, i.e. dock workers. They had always been linked to the port’s history right from the start. Camalli were divided into teams, an organisation system which was rooted in the far past. The birth of the first association of dock workers, Compagnia dei Caravana, dates back to 1340. Their distinctive element was that they were immediately able to obtain the unloading monopoly from the Comune. Also, they drafted a statute providing for mutual aid. Every member had to donate a share of their wages to the association, which could be used to pay for health care and funeral rites. As new docks were built and the port’s size grew larger and larger, the Molo Vecchio was now insufficient. The basin was finally completed in the 17th century with the construction of the Molo Nuovo (“New Dock”) in front of Capo di Faro, where the Lighthouse is located. Yet, this was the century of “caution”, when wealthy families focused on financing European activities while neglecting new business ventures and leaving the port – and the city – in a recession. A slow, unstoppable decline continued until 1797, when the city was conquered by Napoleon. With the Restoration, the Kingdom of Sardinia, a historic enemy, annexed Genoa. 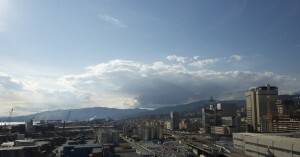 The city was crushed by taxes and Piedmont bureaucracy, which could suit the region’s agricultural economy, but were inadequate in Genoa, a commercial city. Nevertheless, in the period before Italy’s unification, the port received essential raw materials for the cotton, wool and tanning industry sectors. It unloaded iron, cast iron and coal for the steel industry, which became a driving force in Italy after the unification, especially in Piedmont and Liguria. However, infrastructure was still an issue as it could not bear the increase in port activities. The quays were aged, the docks were tiny, which forced vessels to stop in the middle of the basin, while a large number of small barges reached them. Unloading operations required a huge effort in terms of time and costs. Some essential operations were performed, such as the extension of the docks in different stages between 1820 and 1860, the completion of the Darsena dry dock, the opening of via Gramsci – known before as via Carlo Alberto – and other routes including the railway which linked Genoa to Turin in 1854, Lombardy in 1861, Ventimiglia (1872) and La Spezia (1874). Port funds were allocated by the Kingdom. However, they were not sufficient and could only be used for maintenance. Between 200,000 and 400,000 lira were spent on a yearly basis in the same period (1830-1860) when Genoa’s direct rival, Marseille, was investing 25 million. 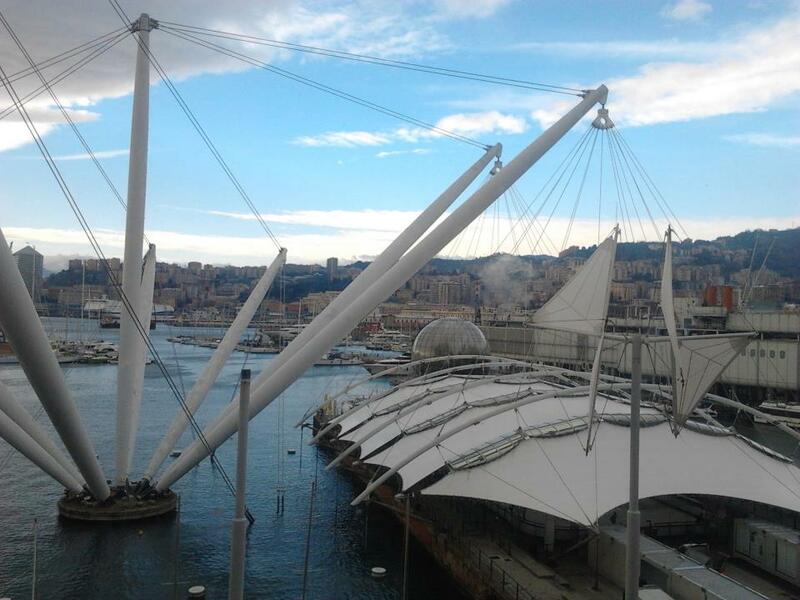 In this period an old marquis, Raffaele De Ferrari, on the way back from Marseille in 1874 compared the two ports and, considering Genoa’s port’s unacceptable inferiority, decided to donate 20 million lira in gold for renovation work. More dry docks were added, works were performed on the docks, quays were expanded, and new bridges were built as well as hydraulic cranes, large hangars, and a railway reaching the quays. The S. Limbania maritime train station was opened. It was linked to those of Caricamento and S.Benigno, while the maritime station for passengers was built on Ponte dei Mille. The state of road surfaces in the port area was also improved. In total, 63 million lira were spent on these works, which improved the port’s efficiency, while giving it a modern appearance. At the end of the 19th century, Genoa’s port received 90% of the raw cotton imported in Italy, 33% of raw materials for the steel and iron industry, 40% of grains which were imported in large quantities due to the farming crisis hitting Italy. These figures were constantly increasing, and at the beginning of World War I the port handled around 7.5 million tons of cargo. In the first decade of the 20th century, new port infrastructure became necessary as a consequence of the continuous growth of port traffic and the demand for services. The grain silo at the S. Limbania quay, the first of this kind in Italy, was built thanks to the money invested by German bankers, while Magazzini Generali del Molo Vecchio (today named Magazzini del Cotone) were built by an English company. Italian businesses built cold storage facilities at Darsena and the wine docks at Ponte Morosini. The lack of balance between imports and exports should also be considered, as 80% of the goods was unloaded, which meant that port costs were high. The situation was even made worse by the large number of emigrants who were leaving for America. Half of them got on the ship in Genoa, which lacked adequate facilities for hosting them. The maritime station was too small, so the crowd had to gather on the quays, thus creating obstacles and dangerous situations. Ten years after the first proposal for a solution, in 1903, the port was given administrative and managerial autonomy with the aim of solving these new problems. For this reason, the Consorzio Autonomo del Porto, or CAP (an independent board for the port, translator’s note), was created. Palazzo S. Giorgio was the headquarters. The CAP introduced a new organisation of camalli activities. Corporations had been dissolved by law and starting from 1870 camalli were called to work day by day. With the foundation of the Socialist Party in 1892, the first workers’ associations were formed in the port. They were divided by category (coal, cereals, and other types of goods) and used strikes in order to claim rights which would be acknowledged and sanctioned by the CAP, such as workers’ census and the opportunity to create cooperatives. These principles were applied in the general set of labour rules, which was the first statute of this kind in Italy. At the end of World War I in 1918, almost half of the incoming Italian ships called at the port of Genoa. Obviously, the lack of infrastructure created serious problems, in that it determined delays which increased costs. After the Great War, the port was downsized, a fact that was sharpened by the Great Depression. During the fascist regime the quantity of imported goods changed significantly, the percentage of coal remained unchanged, while the amount of hydrocarbons and metal for heavy industry rose constantly. The quantity of cereals decreased as a consequence of the boost in domestic production supported by Mussolini. Likewise, cotton was replaced by domestic tissues following an autarchy policy. In the 1920s, the state finally invested the money needed for the improvement of the port. Between 1923 and 1929, 274 million lira were spent on strengthening infrastructure, the long-awaited Lighthouse basin was completed, the third floating dock was constructed while a tunnel was opened through the S. Benigno hill in order to build a railway link, and Via di Francia was inaugurated in 1929. At the foot of the Lighthouse, in connection with the nearby coal basin, a thermoelectric plant was also completed. The so-called Genoa-Serravalle “truck road” was opened in 1935 for road transport, which was gaining more and more ground. In the Thirties, 450 million lira allowed to strengthen infrastructure again so as to serve larger ships; the fourth floating dock was built and the S. Benigno promontory was definitively excavated. In the eastern part, the Foce beaches were cancelled while the small port named Duca degli Abruzzi was turned into a marina, an event which left a sign in the future development of that stretch of coast, where the exhibition centre was built in the Sixties. The port assumed the appearance that it still has today. From 1939 to 1940, as Italy stayed out of the conflict, the port kept working hard and received goods from the North Sea, which had been diverted to Italy because of the conflict. When Italy entered the war in 1940, the scenario changed completely. Genoa, an industrial maritime city and Italy’s first port, became the target of the Allies’ air and sea raids for the whole duration of the conflict. In five years, 86 air raids against the city were recorded, 51 of which in 1944 alone. After five years, the city was half devastated and the port was damaged to the point that it could no longer be used: the expensive renovation structures were destroyed, the basin was covered in dangerous mines, access to the port was hindered by ships that German troops had sunk on purpose, even the docks and dams were seriously damaged, while Palazzo S.Giorgio – the CAP headquarters – was hit by a bomb which destroyed its roof and ceilings. Costly restoration works were started with great energy and completed at the end of 1948 thanks to large state reconstruction funds. Trade got back to the level or even increased within 10 years. However, the port’s typical import-export lack of balance was kept at a 80%-20% ratio. In the postwar period the great changes in the petrol and iron and steel sectors caused problems to the port, as the way of seeing and organising its work changed a lot. Ships were much larger in size, which meant that water had to be deeper, while companies started to build their own fleet and aimed to manage the quays directly as they could not tolerate any delays to their operations. Precise figures show the importance of hydrocarbons. In the space of twenty years, from 1950 to 1970, the percentage of hydrocarbons unloaded soared from 25% to over 70%. At the same time, road transport overtook railway transport, and the Sixties introduced an even more revolutionary element, i.e. containers. A specific coal terminal was built in 1960 in the Cornigliano industrial area, while the new Multedo petrol port was added in 1963. It was built so as to make up for the lack of specialised infrastructure for unloading petrol. The first container terminal – the first in the Mediterranean – was built in Sampierdarena in 1969, and the second was completed in the Seventies, while a plan for building the Voltri-Prà terminal, today’s container port, was also studied. In the meantime, the CAP had already sold the Cornigliano beach (400 metres) to SIAC, the Cornigliano Steel Industry Association, while the airport began to be built in Sestri with money coming from important Genoese companies such as Ansaldo, Piaggio, Ilva as well as the Ministry of Aeronautics. From the late Seventies until the early Nineties freight traffic decreased again. This event pushed the institutions to divide and give a specialisation to different port areas. Each one would be devoted to a specific activity. The birth of today’s Porto Antico started from this significant re-organisation: all of the commercial and industrial activities were banned from the old basin, which has an incredible historic and cultural value. The authorities decided to restore it and leave it to tourists and local citizens. The renovation plan was designed by Renzo Piano and completed in 1992 for the celebrations of Columbus’ discovery of America 500 years earlier. Every building has been restored and designed for a different purpose.